I’m so thankful to know a few NFL players and their families. I met Abry Jones briefly at a Jaguars practice when I shot a few pics of he and his then girlfriend Kate. If you hadn’t heard of Abry Jones yet, tune in this season to the new and improved Jacksonville Jaguars and check out number 95, the defensive tackle. 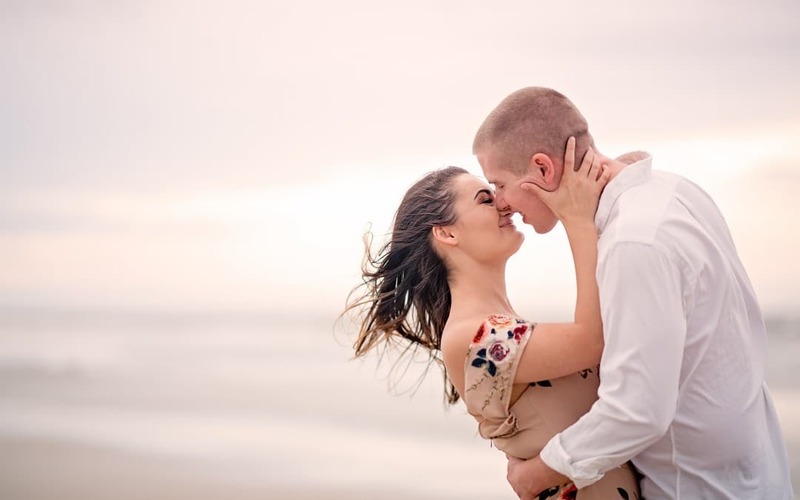 To football fans, he might be known as the Jacksonville Jaguars defensive tackle but to his beautiful fiancee, Kate, he’s known as her husband to be. Kate and Abry have been together since their days attending The University of Georgia. Georgia is where they met and the college sweethearts are currently planning a wedding to take place back in Atlanta. While they already had a wedding photographer in place, (Kate didn’t realize that I was would travel for weddings)…. After I forgave her ;), I agreed and felt so lucky to be able to capture their engagement photos with their gorgeous dogs Storm and Rocco. I have to admit it was so interesting to see a Jones outside of the football game. He’s a football player who is known to Jaguar fans for being such a beast on the field. However, during their engagement session, he came across as so sweet, kind, and loving with Kate and their “babies”. We had such a great time playing with the dogs on the beach and it allowed me to get some candid engagement photos of them. Of course, they looked absolutely stunning during their formal engagement photos too. They are literally the sweetest couple, and I’m so thankful my friend Rayan Marks recommend me for their engagement shoot. Fun fact: During most of the photos without the dogs I was actually holding onto them. It was no small feat to keep the dogs contained and get the shot but I definitely felt like a photographer/ dog whisperer before it was over! It was so much fun photographing Kate and Abry Jones engagement session, they’re such a fun couple. I can’t wait to see what their wedding day is like – AND what Abry Jones has in store next season with the Jacksonville Jaguars.